You’ve heard and perhaps even seen whaling in Japan. Yea you’ve heard that its bad, horrific, simply inhumane, but whaling still goes on in Japan despite the great degree of international attention and pressure. Why does this keep happening? In this post, I am going to examine the current situation of whaling in Japan, the citizens perspective on it and analyse the attempts to stop whaling in Japan. Whaling first peaked in Japan during the post World War 2 period, and seemed to be profitable. However, it has since steadily decreased to the point it is only 1% of the initial whale consumption during the 1960s (IFAW, 2013). Furthermore, horrific findings show that only about much of whale meat remains unsold due to the lack of demand. 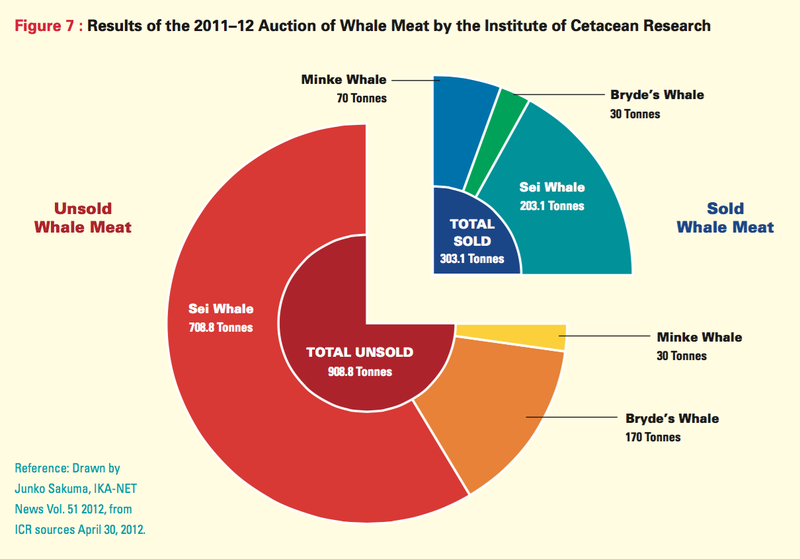 Even attempts to sell the whale meat at auctions reflect the futility, and diminishing future of the whaling industry. Shown in the figure below, only 1/4 of the stock from 2011-2012 were sold. 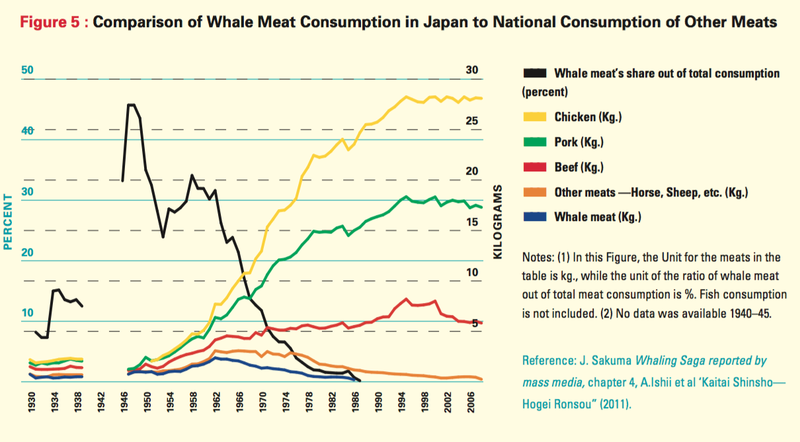 Diagram 2 above evidently shows the rapid decline in the demand for whale meat, shown by the black (share) and blue (mass) line. 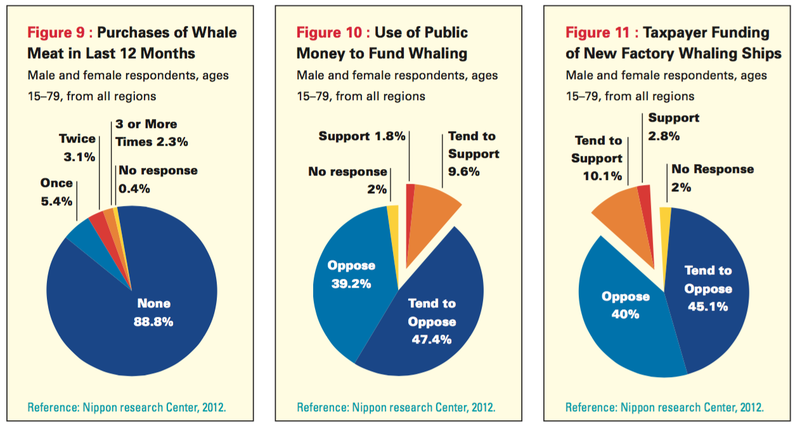 Apart from the change in tastes, these two diagrams show that the Japanese citizens are subtly beginning to turn away from the whaling industry, which is further reflected in the majority’s reluctance to support the unprofitable industry through taxes, with close to 50% who oppose to the use of taxes and public finances to fund whaling activities (shown in the pie charts below). Taken from the International Fund for Animal Welfare (IFAW) ‘The Economics of Japanese Whaling’ The bar chart diagram above reflect the costs incurred for the whaling industry, while the orange portion reflects the subsidies channelled towards whaling, which are the tax payer’s contribution (IFAW, 2013). How is Japan getting away with the killing of whales today? Well that was their explanation for their technically illegal continuation in whaling activities, after the moratorium on commercial whaling was established in 1986 by the International Whaling Commission (IWC). Whales were allowed to be killed for scientific research under the IWC. Ironically, after the moratorium was passed, the Japanese whaling industry went on a bloody massacre killing an excess of 14,000 whales since 1987, compared to 2,100 whales during 1952 – 1986 (34 years). Even under this what I call the ‘excuse blanket’, for the sake of “science”, Japanese whaling companies find themselves at a loss when they have failed to supply the International Whaling Commission (IWC) with information of their research – an extensive and unnecessary killing of up to 4000 minke whales (shown in the featured image) in the past 12 years, and these fate of these whales eventually just become cut up and stocked up in freezers. 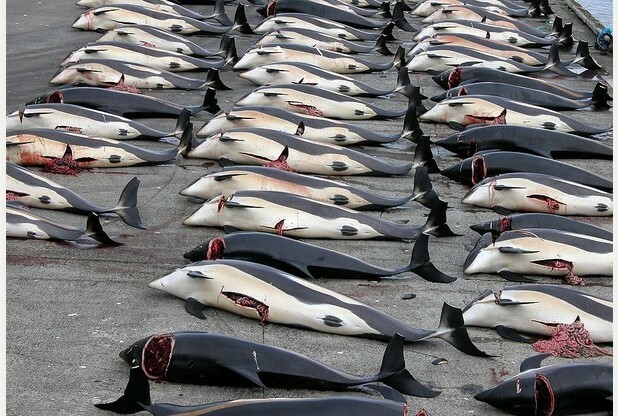 Aren’t they better alive in the magnificent sea, than to be silenced an unjust death and then placed in cold storage? In its defence, Japan cited only two peer-reviewed scientific papers relating to its program from 2005 to the present, during which it has harpooned 3,600 minke whales, a handful of fin whales, and no humpback whales (McCurry, 2014). Regardless, it is evident that the whaling industry is collapsing, with the addition of increased international awareness for the preservation of these whales, as well as the international restrictions imposed which squeezes and attacks the diminishing whaling market. The following diagram shows the relationship between whaling industries, the Institute of Cetacean Research (ICR) and the International Whaling Commission (IWC). 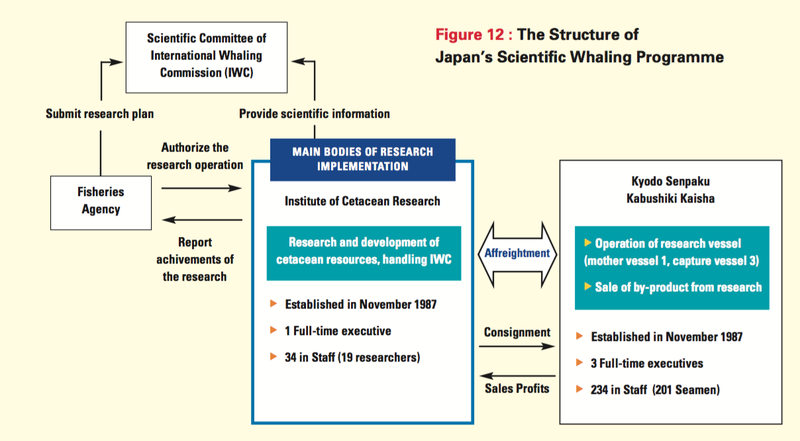 Whaling firms in Japan are held accountable to the ICR, who in turns communicates with the IWC with regards to the on-going research studies being conducted(IFAW, 2013). Taken from the International Fund for Animal Welfare (IFAW) ‘The Economics of Japanese Whaling’ (IFAW, 2013). Are we not strong enough to stop the annual massacre? Australia and New Zealand took on Japan to the International Court of Justice in 2010 in an attempt to reduce or even stop whaling in Japan in the Antarctic. Although what seemed like a promising hope to all whale activists when the International Court of Justice had ordered Japan to stop when it had failed to abide by the law regulations of whaling for scientific research (12 to 4 ratio who were for the whaling in the Antarctic to be ceased), it didn’t seem like verbal order had any effect on the whaling industry, particularly in the North Pacific where whaling activities weren’t affected by the law passed on. However one must also understand that whaling is a controversial issue for Japan especially whose economy is highly dependent on seafood. The presence of these whales pose a threat to the blue fin tuna fishing industry which contributes extensively to the fishing community in Japan. Despite several futile attempts to stop the whaling industry in Japan entirely, these are big steps that are driving us toward undertaking more ethical measures. Japan has reduced its minke whale targets from 935 to 333 (Heraldsun.com.au, 2015), this suggests that at least our efforts are able to change the destinies of 66% of targeted whales. What else can we do, apart from verbal condemnation and disgust for their activities, as we watch more killings occur? Do let me know what you think in the comments. Perhaps most of you readers have the same thoughts as I do, we can’t do much to save or protect these whales as we don’t have the power or authority to tell them to stop. But I believe, as we continue to educate and teach the new uprising generation on the consequences of our actions, we may finally see the fruits of our efforts in the future as our decisions made by the new generation would be those with the welfare of these creatures in mind.